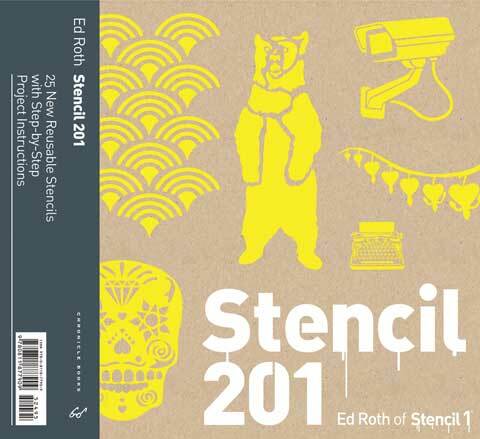 In this collection, stencil maverick Ed Roth presents 25 stencil designs - from retro-cool typewriters, microphones and roller skates to elegant leaves, birds and abstract shapes. The book offers step-by-step directions for more than 20 wildly creative projects that take stenciling to a whole new level. With the help of creative friends such as Erica Domesek of P.S. - I made this and embroidery queen Jenny Hart, Ed shows how to stencil on just about anything -T-shirts, leather, mirrors, food and even hair using a variety of techniques like stitching, etching and more. It also features a pocket in the back of the book to store the reusable stencils once they've been used.